The Senehe Siyapatha initiative, spearheaded by Dialog Axiata PLC, Sri Lanka’s premier connectivity provider, recently saw the completion 25 houses in Eheliyagoda, Ratnapura District. 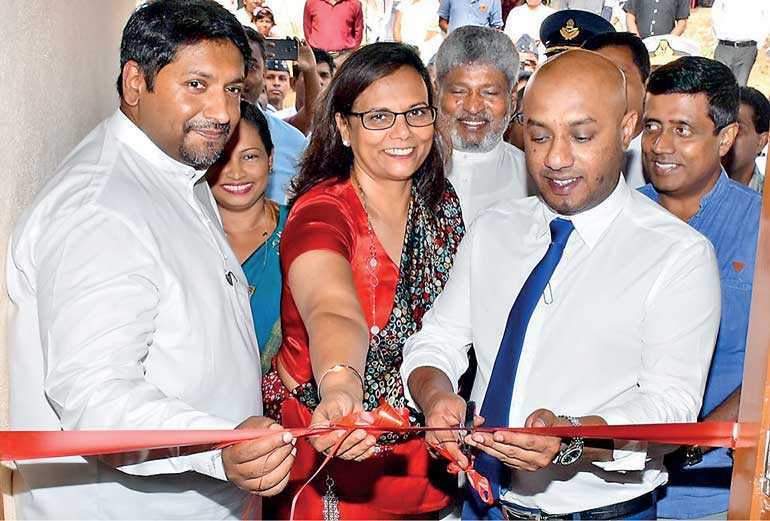 The house keys were ceremoniously handed over to 25 home owners in the presence of Minister of Irrigation and Water Resources and Disaster Management Duminda Dissanayake and State Minister of Defence Ruwan Wijewardene on 28 August in Eheliyagoda. District Secretary/GA – Ratnapura Malani Lokupothagama, Assistant Divisional Secretary – Eheliyagoda Nadee Tharangi Jayasinghe, Dialog Axiata PLC Group Chief Executive Supun Weerasinghe, Dialog Axiata PLC Group Chief Marketing Officer Amali Nanayakkara, RIL Property PLC CEO/Director Hiroshini Fernando and Food Buzz Ltd. CEO/Director Anusha Sanjeewani also graced the occasion as special invitees. The fund was established to provide relief for victims, through generous donations from Dialog subscribers, tripled in value through a donation by Dialog Axiata PLC. Dialog subscribers contributed Rs.16.53 million towards the creation of Senehe Siyapatha 2017 fund and this was tripled by Dialog Axiata adding a further Rs. 33.47 million. RIL Property PLC, also made a donation of Rs. 7.5 million to raise a total sum of Rs. 57.5 million for the ‘Seneha Siyapatha 2017’ fund. The first initiative of Seneha Siyapatha 2017’ in Kotapola, Matara saw the completion of eight houses which were handed over the public on 29 July. Civil construction services for the 25 new houses were contributed at no cost by the Sri Lanka Navy and Sri Lanka Air force under the direction of the Ministry of Defence and supervision of the Ministry of Disaster Management. The houses were constructed as per specifications given by the NBRO (National Building Research Organisation) under the aegis of the Ministry of Disaster Management and the construction supervised by Sierra Construction, whilst the project was managed by Dialog Axiata PLC. “We would like to extend our sincere appreciation to our generous subscribers who have contributed towards construction of 63 new homes over the course of 2017 and 2018. We see the results of a collaborative effort – in which likeminded partners have come together to support a national cause,” said Weerasinghe. The disbursement of funds and the actions of the ‘Senehe Siyapatha’ initiative is independently audited by PricewaterhouseCoopers Sri Lanka.